The Inukshuk symbol of the Vancouver 2010 Winter Olympics is a brilliant reminder that human beings need information whether coded in symbols or in a universal language. Could the original coded text message be a series of stacked rocks? We (were here). Fish (here). Food (here). For the Inuits in the Arctic, yes. Stone giants, standing tall and imposing on the horizon are welcome signs for travelers braving the cold, snow and ice. For Inukshuks and Inunnguaqs are beacons sending messages that “You are on the right path. Someone has been here. You are not alone.” A sense of survival and community is conveyed in this barren empty landscape with no one visibly ahead nor behind. A solitary existence for any hunter yet one with guidance and comfort. These structures are an ancient Inuit tradition of communicating the past, present and into the future. Arms or no arms direct the message. Arms indicate an immediate message of life for hunters – directions to other hunters or even food caches. An Inunnguaq in the shape of a human form with legs and arms may point a rock ‘hand’ in the direction of the previous hunters. With antlers replacing the ‘hands’, the sculpture may have a cache of food tucked high in between two rocks for the next group of hunters. An Inukshuk with no human form will provide news of dangerous crossings or falling rocks; be a marker for an area with plentiful hunting for seal, whale, walrus, fishing or caribou; or be a navigational guide by pointing to the North Star. 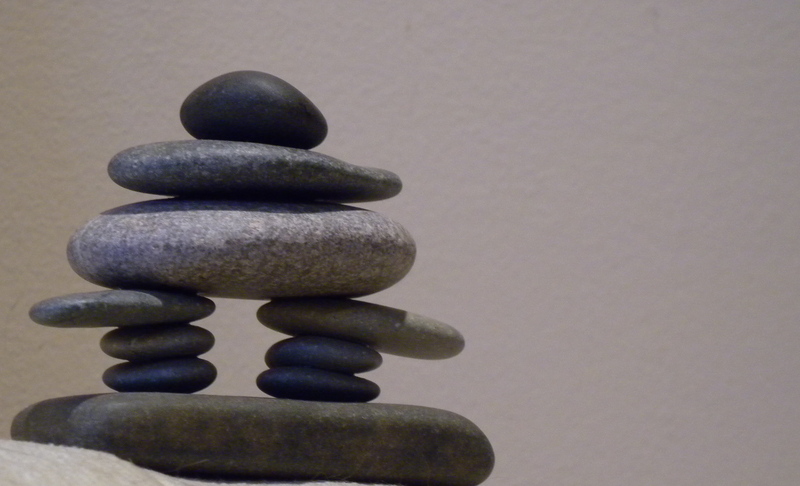 Even how they are constructed – one rock balanced on another built by many. Alone the rock means nothing. Together the rocks share a purpose and importance. Be it a memorial to a fallen hunter, a trail marker, or a cache of food, these Inukshuks or Inunnguaqs on the horizon are a comforting site. The Vancouver 2010 Winter Olympics introduce the Inukshuk as the national symbol of Canada. Athletes and television viewers from around the world will join in the spirit of sportsmanship from February 12 to February 28, 2010. Consider the message of the Inukshuk when viewing the Olympic games. Even in the most barren of landscapes the human being needs news and information and each other. Of course, sitting with one another and directly sharing news in every culture is most special. However, with technology today we share bits of information through a multitude of sources – newspapers, magazines, radio, television, cable television, postcards, letters, books, a variety of phones (land line, cell, satellite), the internet, GPS, e-mai, web sites, blogs, tweets, Facebok and even text messages with bizarre short cuts in language to send coded messages. The Inuit way was to build “road” signs through a recognized systematic structure of rocks to send a message to the next traveler … Help yourself to food and see you in the next village (that way). The Inukshuk is a coded message comforting and connecting human beings. Working together by sharing information is vital to our livelihoods and survival. Tags: 2010 Winter Olympics, Arctic, Canada, Inuit, Inukshuk, Inunnguaq, Original text message, Vancouver, Winter Olympics. Bookmark the permalink.